Almeta West Bradford obituary. Carnes Funeral Home. Mrs. Almeta West Bradford was born on March 10th, 1920 to the parents, of Reverend Jerome and Addie (Gilbert) West in Bedias, Texas. She joined two children, Juanita and Odell, followed by the birth of other siblings, Walter, Kaleta, Lallie, and Isaiah. She passed away peacefully, Friday, March 6th, 2015 at Regency Care Center in League City, Texas. She started grade school in Grimes County School District and graduated May 30th, 1939 from Navasota Colored High School. After graduation, she worked on the farm and had the determination to excel, so she attended Beauty School and became a licensed Beautician. Owning and operating a Barber and Beauty Shop in Dallas, Texas along with her husband, Reverend Henry Bradford, for over forth-five years. Rev. Bradford became the Pastor of Union Baptist Church in Italy, Texas; she became the musician they served there for thirty-one years. After the death of her husband, she returned to Madisonville, Texas and continued her membership with Shiloh Missionary Baptist Church and remained faithful until her death. She moved to Texas City, Texas to be with her family, brother in law, Harry Lee and, niece, Mattie James. She is preceded in death by her parents, siblings, husband of forty years, the Rev. Henry Bradford. 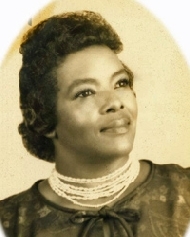 To rejoice in Her Victory of God’s promise of eternal life, Devoted Niece, Mattie James; Brother in law, Harry James; Sisters in law, Priscilla West , Minnie West, Ethel Bradford; 26 Nieces and Nephews; a host of Great Nieces, Great Nephews, Cousins, Union Baptist and Shiloh Church Families, other Relatives, and Friends. A Public Visitation will begin Saturday, March 14, 2015 at 11:00 AM followed by A Service of Celebration at 12 Noon. Both Services will be held at Shiloh Missionary Baptist Church 205 S MLK Madisonville, Texas 77864. Burial is to follow at West End Cemetery in Madisonville, Texas. Local Services are with Carnes Funeral Home - Texas City, 3100 Gulf Freeway Texas City, Texas 77591. Memorials may be sent to the Local Funeral Home before Friday or Saturday to the Church in Madisonville. Dorthea Lewis Jones is the Family Funeral Director.